A married couple (Mark Wahlberg and Rose Byrne) look into adoption after they decide they want to have kids. They find a teenager named Lizzy (Isabela Moner) who they like, but she comes with two younger siblings - 10 year old Juan (Gustavo Quiroz) and Lita (Julianna Gamiz), aged 6. The clan get along together just fine until cracks start to show - especially when the kids' birth mother turns up. Chaotic families is a subject matter that director-writer Sean Anders has indulged in before. Examples on his resume include 'That's My boy', 'We're the Millers' and the 'Daddy's Home' movies. 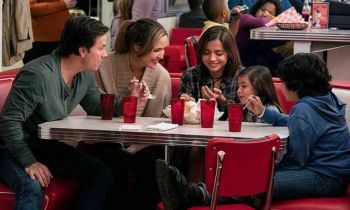 While those movies got a mixed reception, Anders seems to have found the sweet spot with 'Instant Family' as he focusses less on the comedy and more on the heart of the movie. That isn't to say that 'Instant Family' isn't funny. After all, the mishaps that the three kids get up to and struggles of parenting are highly amusing and definitely relatable. But what stays with you after the movie ends is the heartfelt stuff. 'Instant Family' is also commendable for tapping into some pretty deep issues, like broken homes and drug abuse, without ever becoming overly dark, always bringing the focus back to the home and family as a place of healing. At one point, parents Pete and Ellie bring up the topic of whether they'll be judged for being white parents to latino children, an uncomfortable question which is admirably tackled head-on. Mark Wahlberg and Rose Bryne make highly likeable leads with Bryne getting to grapple with a more neurotic personality as she did so well with in 'Bridesmaids', and Wahlberg seeming more enthusiastic in a film than he has in a loooong time. As the social workers, Octavia Spencer and Tig Notaro alternate between being funny and delivering tough home truths effortlessly. As 15 year old Lizzy, Isabela Moner makes a sizeable impression, and Margo Martindale is brilliant as Grandma Sandy. Thanks to strong performances, an incisive script and smart direction, 'Instant Family' is a sweet, touching and endearing movie that really is one for all the family.